The Bureau of Labor Statistics released its regular monthly jobs report on June 6. Nonfarm payroll employment rose by 217,000 – a broadly similar pace as in recent months. But most news reports focussed on noting that total jobs in the US (actually, total nonfarm payroll jobs) have now for the first time exceeded the peak previously reached in January 2008, before the sharp fall that began in the last year of the Bush presidency. It took the economy six years and four months to get back to the level of employment it had then. While this is a significant benchmark, it is not all that meaningful by itself. The labor force has continued to grow over the last six years, so unemployment remains high (at a rate of 6.3% currently). Conservative critics have charged that the pace of job creation under Obama has been slow, and assert that the slow pace is due to Obama’s anti-business administration (they allege), with high taxes and increased regulation, the negative effects (they assert) of the measures under the Affordable Care Act to make it possible for the uninsured to obtain health insurance coverage, plus an allegation of “increased uncertainty”, as all acting to hold back the private sector from creating new jobs. To judge such allegations, one might examine the pace of job creation during Obama’s term to the pace during the term of George W. Bush, a conservative Republican who was purportedly pro-business and anti-regulation, and who presided over record tax cuts. One needs also to separate net job growth in the private sector from net job growth in the public sector to understand the story. 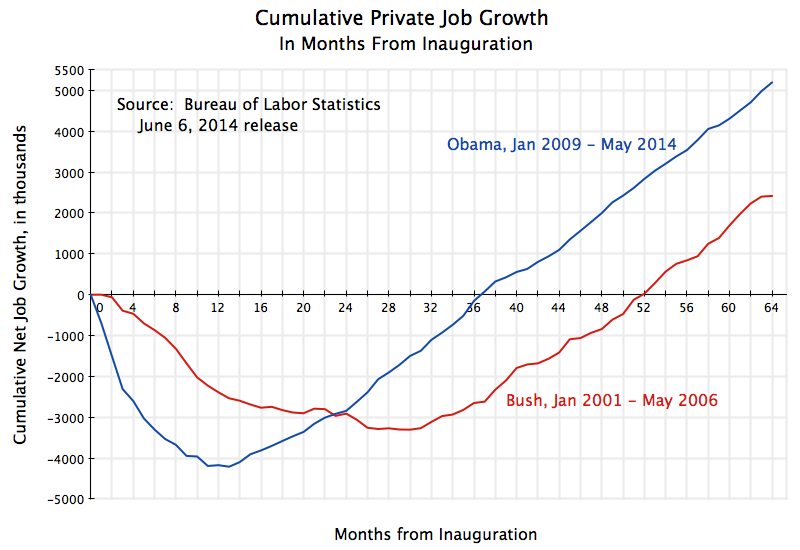 1) Net private job growth has been far higher under Obama than under Bush. As the top chart shows, there were 5.2 million additional private sector jobs in May 2014 compared to when Obama was inaugurated, and an additional 9.4 million private jobs from the trough reached in February 2010, a little over a year after Obama took office. Private jobs were disappearing at a rate of over 800,000 every month when Obama was taking the oath of office. This was soon turned around as a result of stimulus measures and the aggressive actions of the Fed, with the rate of decline at first diminishing and then positive job growth appearing a year later. Under Bush, in contrast, there were only 2.4 million more private jobs at the same point in his presidency relative to when he took office. A primary reason for this difference is that while the economy was collapsing when Obama took office (which he then turned around within a year), the downturn at the start of the Bush term in 2001 began after he took office. The economy then began to turn around (in terms of job growth) only two and a half years into Bush’s term in office. Only then did private jobs begin to grow under Bush. 2) Once the private job growth began (13 months into Obama’s term, and 30 months into Bush’s term), the pace of that job growth has been remarkably steady in both administrations. There were month to month variations, of course, particularly in the data as originally announced (but then later revised, in the regular process to incorporate more complete data as it becomes available). That is, the lines in the chart above for private job growth are both remarkably straight once the turning points were reached. 3) Not only was the pace of private job growth remarkably steady after the turning points, they are also remarkably similar in terms of that pace for Obama and Bush. That is, the two lines in the graph above are roughly parallel to each other after the respective troughs. The pace of private job growth has been 184.5 thousand per month under Obama up to now, and a bit less, at 168.2 thousand per month, under Bush from his trough up to the same point in his presidency. Thus there is no support in this data for the assertion that private sector job growth has been especially slow under Obama, due to an alleged anti-business administration. Private sector job growth under Obama has been similar to, and in fact a somewhat higher than, the pace under Bush during the respective recoveries. And total private job growth is far higher under Obama than it was at the same point in the Bush presidency, as the recovery was earlier under Obama. 4) Where Obama and Bush do differ, and markedly so, has been in net government job growth. 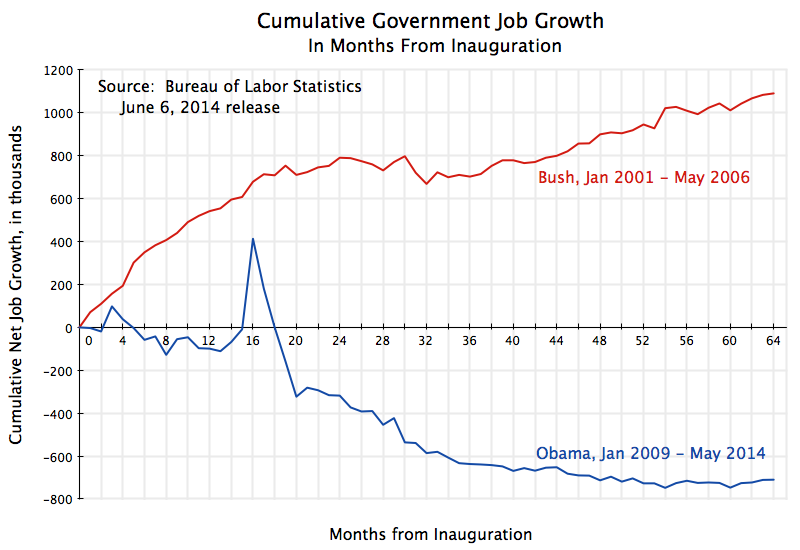 Government jobs grew strongly under Bush (as they have for all recent presidents other than Obama; see this blog post). But net government jobs have fallen sharply and consistently under Obama. Only in the last year or so have they leveled off, but with no recovery in number. Keep in mind that government jobs include jobs at all levels of government, including state and local government. It is not just the federal administration that is covered here. But the impact on the economy is similar whether it is a locally employed school teacher being laid off, or a researcher employed by the National Institutes of Health. Bush is viewed as the small government conservative. But government jobs grew by 1.1 million from the month of his inauguration to May 2006. Government jobs fell by 710,000 over the similar period in Obama’s term. 5) Thus part of the reason net overall job growth has been disappointing during Obama’s term is not that private job growth has been slow, but rather that government has cut back on those it employs, hence bringing down the overall total. If government jobs had simply remained flat during Obama’s term in office, rather than fall by 710,000, the direct impact on the unemployment rate would have been to bring that rate down to 5.8% from the current 6.3%. But that would be the direct impact only. There would also be indirect impacts. The now employed school teacher or researcher would spend their newly earned income on what they need, which would lead to increased demand for products and employment of additional workers to make them. (See this Econ 101 blog post on the multiplier and what it means.) Assuming a not unreasonable employment multiplier of 2 under current conditions, the impact of simply keeping government employment steady rather than allowing it to fall by 710,000 would have been to bring the unemployment rate down to 5.4%. Had government employment been allowed to grow under Obama as it had under Bush, the impacts would have been significantly larger. The direct impact alone (before the multiplier) would have brought the unemployment rate down to 5.1%. Mechanically applying a multiplier still of 2 would imply an unemployment rate brought down to 4.0%. But this would have then been at the low end of the range normally taken to represent full employment (of perhaps 4% to 5 1/2%, depending on the assessments of different analysts), and it would no longer be correct to assume a multiplier would have remained at 2. Rather, and as discussed in the blog post cited above on multipliers, there would have been other reactions, including most likely by the Federal Reserve Board. With the unemployment rate having been brought down to the full employment range, one would expect that the Fed would have shifted back to a more normal interest rate and monetary policy from its current policy (due to the still high unemployment) of targeting interest rates to as close to zero as possible. To conclude, far more private jobs have been created during the Obama presidential term than during the same period in the term of George W. Bush. In part this was due to the more rapid recovery under Obama (due to the stimulus and other measures taken) from the economic collapse he inherited from the last year of the Bush administration, than the recovery under Bush from the downturn that began a few months after he became president in 2001. But it is interesting to see that once the respective recoveries began, the pace of private job growth was similar during the Obama recovery as under the Bush recovery (and indeed somewhat faster under Obama). And this is despite the contractionary policies followed by government since 2010. For the first time since at least the 1970s (I did not look back further in that blog post), government spending has been cut in an economic downturn, rather than allowed to rise to make up for insufficient aggregate demand. Where the Obama and Bush periods differ, and substantially, is in government employment. Government employment grew under Bush (as is normal, and as has been the case under every prior president since at least Eisenhower), but has been cut sharply under Obama. It is because of these cuts that total employment growth under Obama has been disappointing. Without those cuts, the economy would have returned to full employment some time ago. This entry was posted in Labor and tagged austerity, employment growth, government employment, government spending, job creation, jobs, private employment by aneconomicsense. Bookmark the permalink.